The application is open until May 31, 2017. Observing the neutrino burst from the next nearby core-collapse supernova (SN) is perhaps the most coveted target of low-energy neutrino astronomy (few to few tens of MeV). Several existing or planned large detectors world-wide will produce high-statistics signals, dwarfing the two dozen neutrinos observed from SN 1987A, the only such measurement to date. Moreover, the diffuse SN neutrino background (DSNB) from all past core-collapse events in the universe is coming into reach with the foreseen gadolinium-enhanced version of Super-Kamiokande in Japan and the JUNO scintillator detector being built in China. The experimental landscape is evolving rapidly, primarily driven by neutrino oscillation physics, and by advanced gravitational wave detectors becoming operational. At the same time, core-collapse theory is quickly making progress, driven by large-scale three-dimensional simulations, new insights concerning the nuclear equation of state, a renewed appreciation of the role of failed SNe (black hole formation in stellar core collapse), and groundbreaking developments concerning neutrino flavor evolution in dense environments. Information flow and mutual understanding between supernova and neutrino theorists and protagonists of the evolving experimental side have not kept pace with the speed of changes in these fields. This Topical Workshop, involving around 30 leading experts in these areas, is meant to interface these communities with the goal to develop a better definition of the observational targets (What can we learn?) and conversely of the deliverables that should be provided by neutrino and SN theory as possible benchmarks for detector optimization and observation strategies (What should we do?). 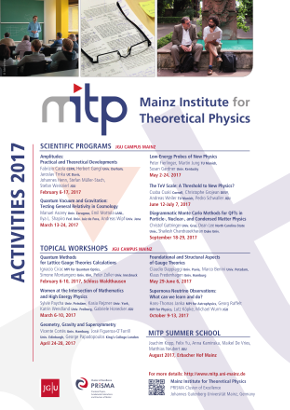 MITP is an ideal place for such a discussion due to the deep experimental involvement of local groups in the IceCube South-Pole detector, one of the leading SN observatories, and in the upcoming JUNO experiment, which will be a leading SN neutrino observatory and pioneering DSNB experiment.